It’s Metal Monday once again, which means it’s time to bring together my two favorite things, metal music and video games. 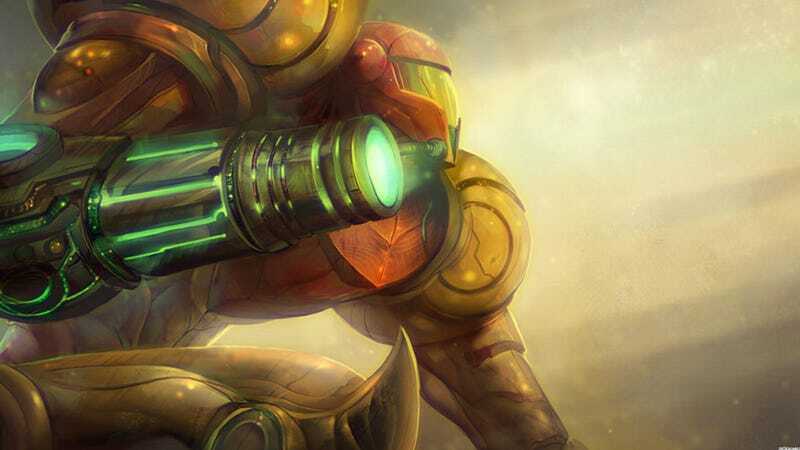 In previous installments we’ve jammed to some metal covers of songs from the Zelda and Pokemon series, but now we’re going to check out some from the Metroid series! The Metroid series has always had amazing music, and its soundtrack has had much darker vibes then many of Nintendo’s other flagship franchises. Naturally, those darker vibes lend themselves really well to metal. Here are five of my favorite metal covers of Metroid Songs! Metroid Prime on the Gamecube was Samus’s first solo foray into 3D space and was the first Metroid Game I played. I absolutely loved its industrial sounding sci-fi soundscape, especially the main title theme that plays when you first start the game up. Ro Panuganti created an awesome djenty progressive metal cover of that theme that rocks hard with crunchy guitar tones, sick riffs, and, of course, the electronic vibes of the original composition, although those are more in the background in this rendition. It’s just an all around awesome and heavy track. It’s also part of Panuganti’s 6 track Metroid EP titled The Dark Hunter, which is available on most music platforms. This groovy as hell cover of the Brinstar Red Soil theme from Super Metroid heavily features FamilyJules, and their team-up is perfection. This track is actually how I discovered ToxicxEternity’s music, thanks to the power of collaboration! This track turns the calm and slow original composition into a real headbanger driven by a groovtastic riff. The song comes right out the gate with that riff, before cutting to an awesome acoustic part. Then the layered lead guitars come in to build up to the rest of the song. Jules handles all the bass on this track, while Toxic handles the acoustic and rhythm guitars, but the best part is how the two trade off the lead guitar parts and solos, as well as the sections where they harmonize for ultimate epicness. When it comes to Metroid music, the Brinstar theme from the very first game in the series on NES is one of the most iconic tracks, and it would be a shame not to include a cover of it on this list. This cover by FamilyJules, which was featured on the Multiplayer VGM cover album alongside tracks from other cover artists, starts off with a clean intro that builds up with some bass before breaking out into full on metal mode. The melodies in this song just work so will on metal guitar, and it all makes for a very epic rendition of the song. The musical theme for the lair of Space Pirate baddie Kraid in the first Metroid game was eerie and creepy, but this technical prog metal cover by RichaadEB takes it in a different direction while still maintaining some of that eeriness. This cover is just packed full of intricate rhythms, crazy blast beats, and delicious lead guitars. It shreds hard and grooves harder, but it never loses the feel of the original chiptune version. First appearing in Super Metroid, and returning in different forms in many more games in the series since, Ridley’s boss battle music is an iconic video game boss theme. It’s fast and hectic, making it perfect for metal. This “epic metal” cover by LittleVMills, which appears on the Operation: 1-Up charity album, lives up to the name, being quite epic indeed. It hits hard right out the gate with pummeling drums, crushing riffs, and awesome lead guitars, all underscored with a symphonic backing track. The shreddage on this cover is off the charts. But it’s not all just shredding either. The middle of the song pulls back to clean rhythm guitars and eerie lead melodies for a near interlude before returning to the epic metal once again.